It’s busy in the Pink Roadhouse. Two tourists search for the perfect Tshirt. An indigenous mum and baby girl stand and wait. We are getting our takeaway cups filled with coffee, it’s early and we are the first customers at the coffee machine. Richard is keen to get on the road today. 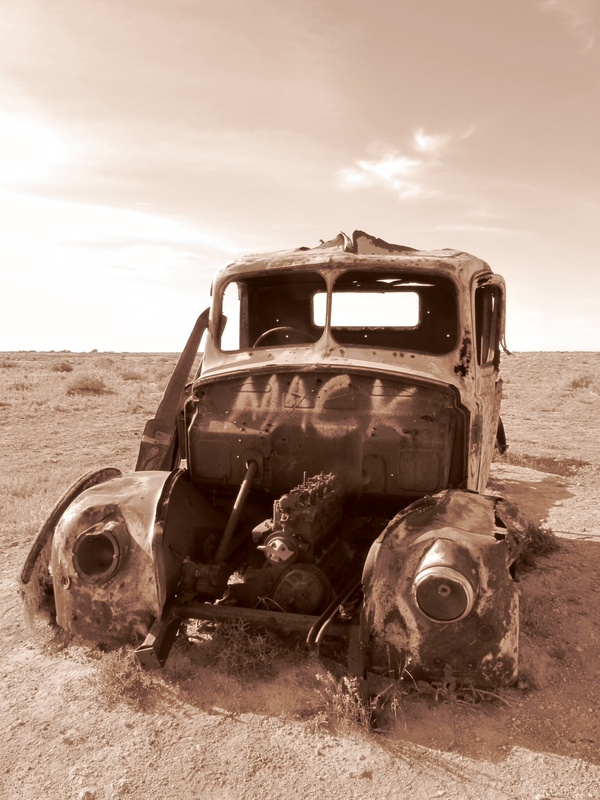 He’s looking forward to seeing the remains of the Old Ghan railway that runs beside the Oodnadatta track. You could call the track an open air museum, there is so much history here. The Ghan railway has a mystique about it. It was a pioneer railway with a long and protracted history. It was originally named the Afghan Express after the camel trains that served the inland routes in the nineteenth century. The old route was discontinued in 1980 because it was frequently washed out by floods and the timber sleepers had to be replaced often because of termite damage. In its heyday it carried passengers and supplies from the ports of Adelaide to the outlying townships in the remote inland territory, all the way to Alice Springs. If the train got into trouble, the passengers had to get out and help rebuild or clear the track. It was a steam railway and needed water. It followed the same route taken by the Overland Telegraph Line, by the Afghan cameleers, by early explorers and before that by Aboriginal ochre traders. They all followed the water. The track follows a string of mound springs where water bubbles up to the surface from the depths of the Great Artesian Basin. Follow the water. Not a bad adage for Australian life. The flat, red gibber plains of this country are familiar to us now. They run unimpeded to the far horizon, reflecting the light from the morning sun. The old railway track follows the curves of the road and we are soon deep in industrial archaeology. 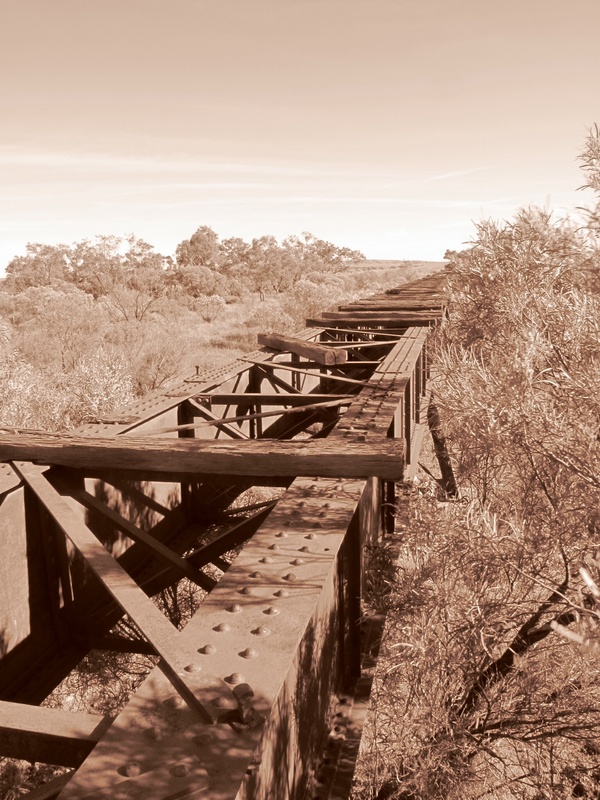 We stop for bridges, embankments and to wander through old ruined railway buildings. 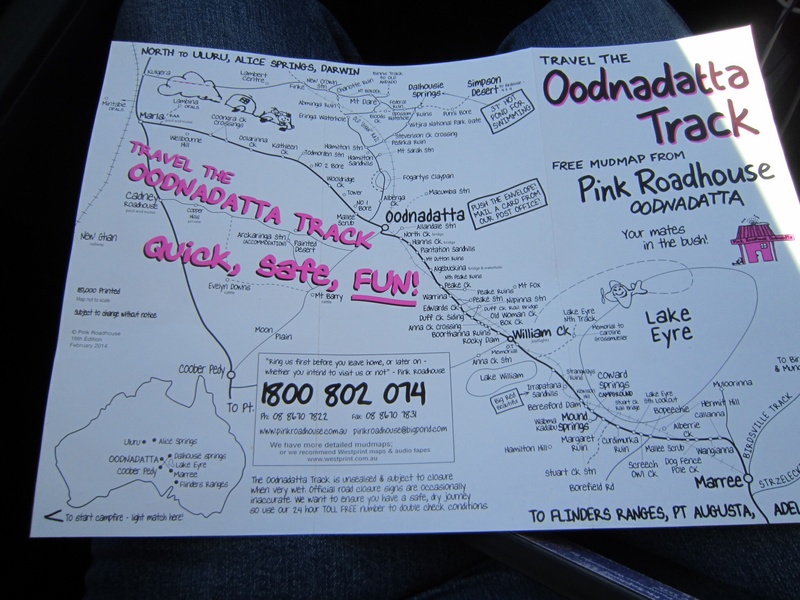 The Oodnadatta Pink Roadhouse publishes a hand-drawn track map, given out for free, and has set out homemade road signs pointing out the sights to see on the rail trail. It is uniquely quirky. This feels more and more like a treasure hunt. 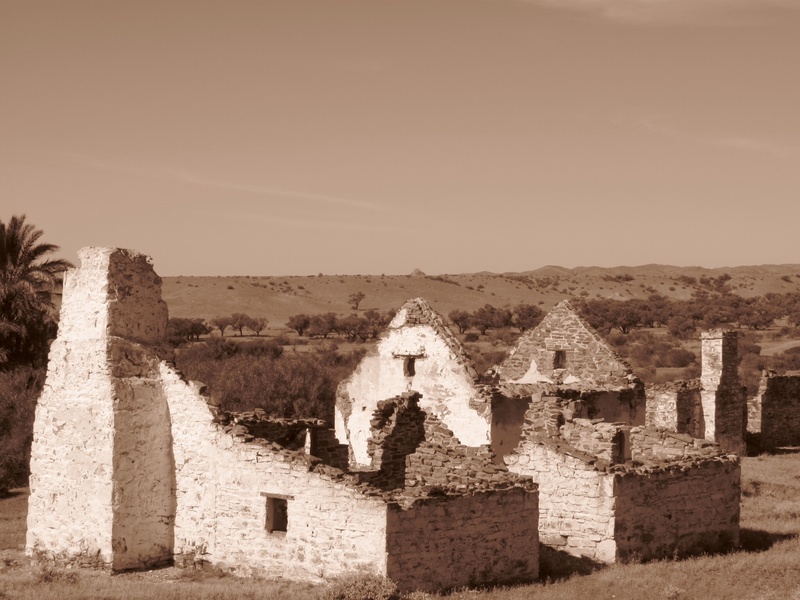 The ruined buildings so isolated even in their day evoke a wistful sadness. The age of steam, once at the leading edge of technology, is now a romantic memory. How long will the bridges and buildings stand before they disappear into the featureless flat plains? On the recommendation of the pink mud map, we take a 15 km detour off the main route, up a long winding sandy track. Heading into the remote area off the already remote track feels like an adventure. We are making for Peake Creek, settled around the telegraph line in the 1860s. After a slow drive along the poorly maintained track, we are disappointed to see a lonely pile of bricks ahead of us with a sign next to it. Fortunately, there is more. This is the eating house, or what is left of it. The settlement lies just around the corner. The sound of squawking cockatoos swirling around an unexpected group of Palm trees tells we have arrived. The settlement was built on a spring. It’s an eerie, deserted place. 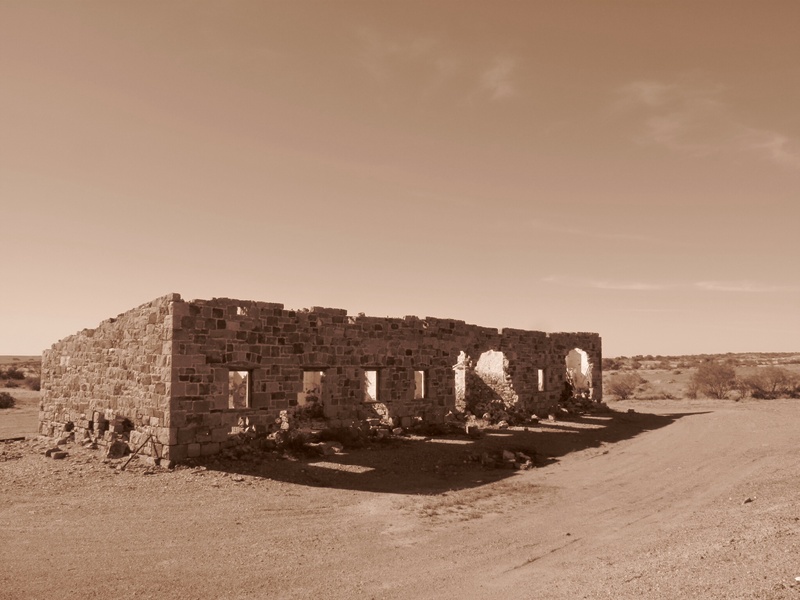 The telegraph station’s grandeur can still be seen in its ruined state. The inhabitants even built a copper smelter, such was their optimism about the future of the settlement. But it all came to nothing and eventually, when the telegraph ceased to be essential, the copper failed to be economic and the droughts came, the pioneers walked away. We turn off the Oodnadatta track at William Creek, a tiny town, apparently all owned by one man. The pub sells everything. Bush humour is alive and well. A parking meter has been installed outside the pub for tourists. We do not have time this trip to follow the track all the way to Marree, so we head off across the Woomera Prohibited Area, the rocket testing range for the Australian army. We only see one other vehicle along the track, an old truck that has seen better days. 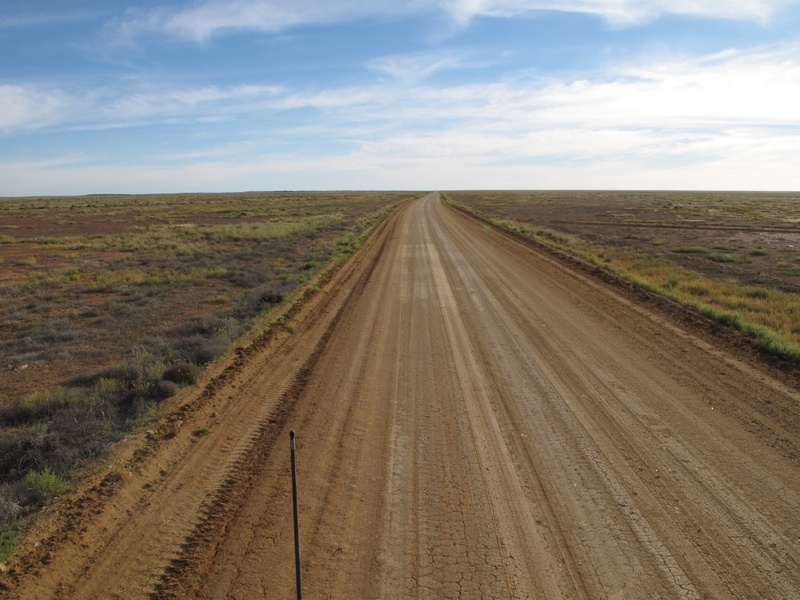 Two hundred kilometres of the loneliest, most remote driving we have done. No emus. No dingos. No camels. Just two old bulls who stare at the ute and look prepared to send us on our way. The opal mines of Coober Pedy are a welcome sight on the horizon, although they signal the end of our outback trip. Tomorrow we head down South on the highway. We have come to the end of our outback adventure and what a grand adventure it has been. This entry was posted in Going home and tagged Australia, Ghan Railway, Outback, Red Centre, Travel on 13/06/2014 by Deb McSephney. Thank you Sylvia. We have so many memories to take home with us. What an amazing country we live in.